I just got the e-mail from Microsoft that version 1.9 of Lync News has been approved and published. It’ll take a little while still to make it to the Marketplace (most likely when I wake up in the morning). Here is the direct link to the app for Windows Phone and here is the Android link. 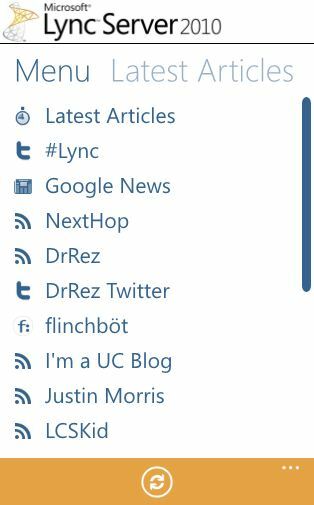 Edited feed from Twitter for the #Lync hashtag to include @User. I received a comment noting that the initial Twitter feed did not list the name of the users’s Twitter handle for any of the tweets. I dug around and found out how to do this and updated the app to reflect that. See – feedback works! And for those keeping score at home, you’ll not that it appears version 1.8 was skipped. I think that is a reflection of my inability to properly title my blog entries than it does a skipped version number.